Niall Allsop and his wife Kay of Bath, England, began vacationing in Italy after making friends with Vittorio and Ivano Capetti, owners of an Italian restaurant in Bath. Their initial forays took them to Tuscany, but they came to their senses soon enough, and began to explore the Italian south. I like the way these people travel: Not rushing from monument to museum, but making friends, meeting people. Many of these people happen to own or work in restaurants, because like most of us headed for Italy, they love the food. But their secret to successful travel in Italy is not just making friends with the waiters. It is also adapting to the rhythm of Italian life–which means taking the early afternoon ‘siesta’ along with the rest of the country. It’s learning to speak a bit of the language, at least. It’s driving like an Italian when driving in Italy. I enjoyed wandering through Sicily, Sardinia, Naples, Apulia, and Calabria with them, and previewing some travel experiences I’d like to have myself. They found the trulli houses of Alberobello trulli disappointing, and delighted in the performance of Euripides’ play Ecuba in the classical Greek theatre in Siracusa. They discovered, from one of their hosts, a recipe for orange-coffee liquor, which they kindly included in the book. They were willing to be sidetracked from the usual travel highlights by people and places not found in the tourist guidebooks. 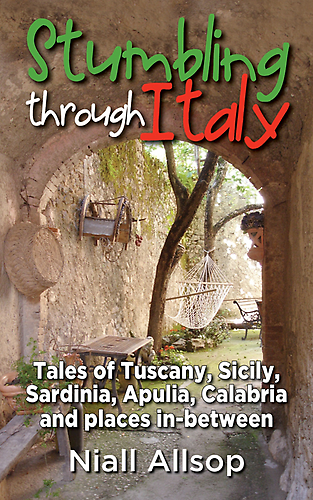 Especially helpful–a chapter on Italian language tips for the novice, and a chapter on driving in Italy for the brave, though some might say foolhardy. Niall Allsop’s writing is more serviceable than brilliant, but he leads us on an enjoyable stroll, a passeggiata through southern Italy, which you might enjoy, as I did. This entry was posted in Books and tagged book review, Italy, Niall Allsop, Stumbling through Italy, travel. Bookmark the permalink.